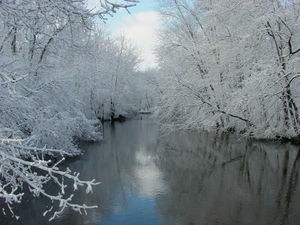 The Paw Paw River is located in the U.S. state of Michigan in the southwest portion of the lower peninsula. It is formed by the confluence of the north and south branches in Waverly Township in the northeast of Van Buren County. It flows approximately 89 miles through Van Buren County and Berrien County until joining the Street Joseph River just above its mouth on Lake Michigan at Benton Harbor. Native Americans named the Paw Paw River after the paw paw fruit that grew abundantly along the river's banks. The watershed covers about 445 square miles, mostly in Van Buren County, and also drains a tiny portion of Kalamazoo County. The watershed includes rare Great Lakes marshes and floodplain forests, which serve as habitats for migratory birds such as the Prothonotory Warbler (commonly known as the Golden Swamp Warbler), as well as the endangered Mitchell Satyr butterfly. Other rare species include the Massasauga rattlesnake and the spotted turtle. The Paw Paw River has 39 species of fish including walleye, bass, bluegill, black crappie, and northern pike.